Today I’m excited to share this recipe as part of an ongoing partnership with DeLallo Foods. All opinions expressed are purely our own. Thank you for supporting us and the brands we love. And don’t miss the Al Fresco Dining Set giveaway (valued at over $3,000!) at the end of this post! There’s something to be said for a salad that you eat with a knife and a fork. 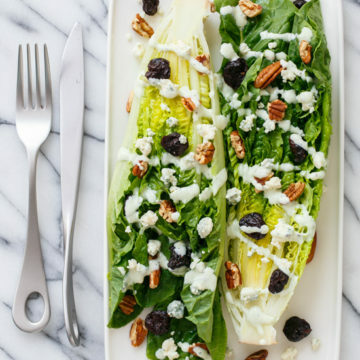 We set out to create an updated take on the classic (but kind of boring) wedge salad, giving it a vibrant update with hearts of romaine lettuce and a tangy buttermilk black pepper dressing. 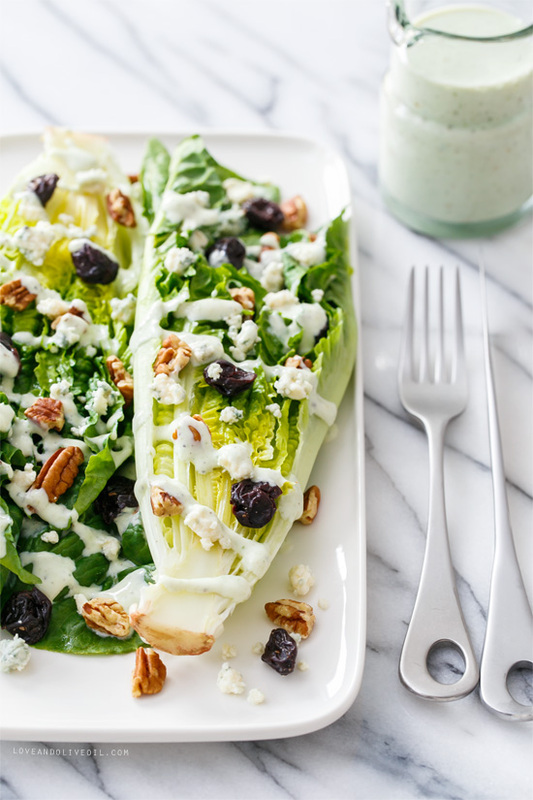 The Vibrant SaladSavors® includes blue cheese crumbles, toasted pecans, and dried cherries, a perfect compliment to the hearty lettuce and creamy, peppery dressing made with greek yogurt and buttermilk. Not to mention the salad is easy to throw together, which makes it perfect for an outdoor summer soirée. No wilted lettuce, no complicated parts, just a hunk of lettuce, SaladSavors®, and homemade dressing. It’d be great served with grilled steak or chicken, accompanying a roasted pork tenderloin, or crispy fried chicken. We’re not the only ones talking salad today. Be sure to check out the other featured SaladSavors® creations and pairings from Two Peas and Their Pod, Gimme Some Oven, A Spicy Perspective, and Skinnytaste. As you can see from the widely different recipes, each SaladSavors® kit has its own distinct personality (Fresh, Zesty, Vibrant, Bold, and Sharp), not unlike the five participating bloggers (I’ll let you decide who is who, haha). For this recipe wanted to highlight the unique combinations of flavors within the kit. While Vibrant was the one we ultimately chose for this wedge salad, Bold (with gorgonzola, dried pears, and sliced almonds) was a close contender. Unlike other salad ‘kits’ on the market today, the SaladSavors® line gives you the freedom to be creative with your salads, to choose your own lettuce and whip up your own unique dressing. You’re not confined to someone else’s idea of a perfect salad. I know that’s a big selling point for me, as I tend to enjoy salads that are a bit beyond the expected. SaladSavors® are currently available in select stores including Winn Dixie, Giant Eagle, and select Walmart stores across the country, with more stores coming soon (and if you can’t yet find them locally yet, you can also buy them online). However, one lucky winner is in for a treat: a year’s supply of SaladSavors® is up for grabs, along with a slew of other goodies (including the gorgeous Marimekko porcelain platter pictured above). Keep reading for full details and your chance to win! In a blender or food processor, combine garlic, yogurt, buttermilk, chilves, lemon juice, white wine vinegar, and pepper. Blend or pulse until smooth. Season to taste with salt. 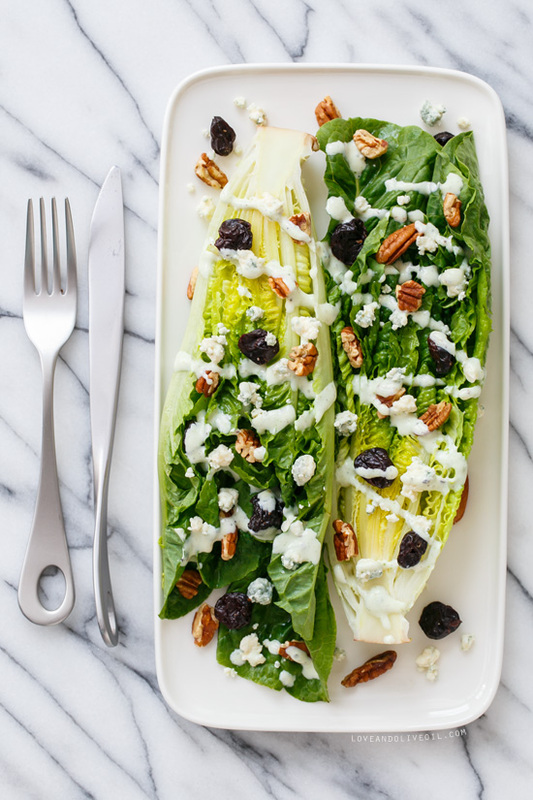 Trim romaine hearts and split in half lengthwise. Arrange one half, cut side up, on each plate. 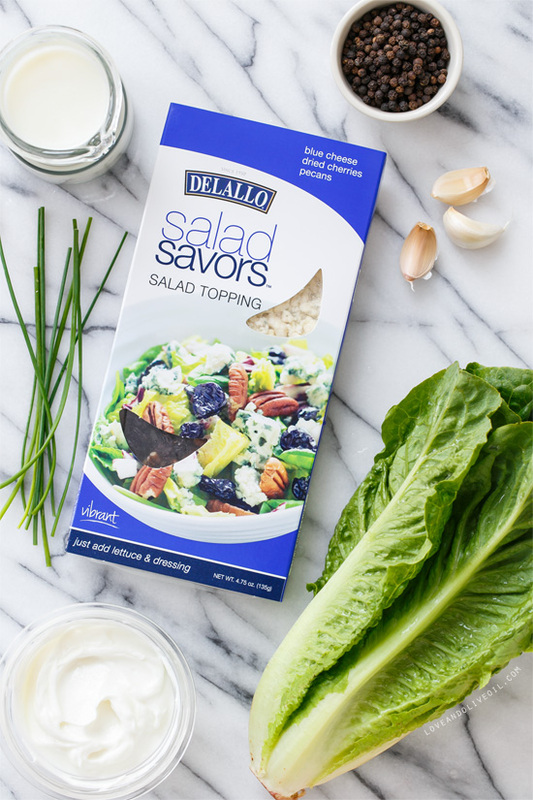 Sprinkle with SaladSavors® toppings (blue cheese, pecans, and dried cherries) and drizzle with buttermilk dressing to taste. Leftover dressing will keep in a jar or airtight container for up to 1 week. Al Fresco Dining Experience Set: Worth over $3,000! Accessories, drinkware, décor, and much more to create the perfect atmosphere for an al fresco dining experience! Enter now through through June 22, 2014. Entries open to U.S. residents only. Good luck, happy al-fresco entertaining! 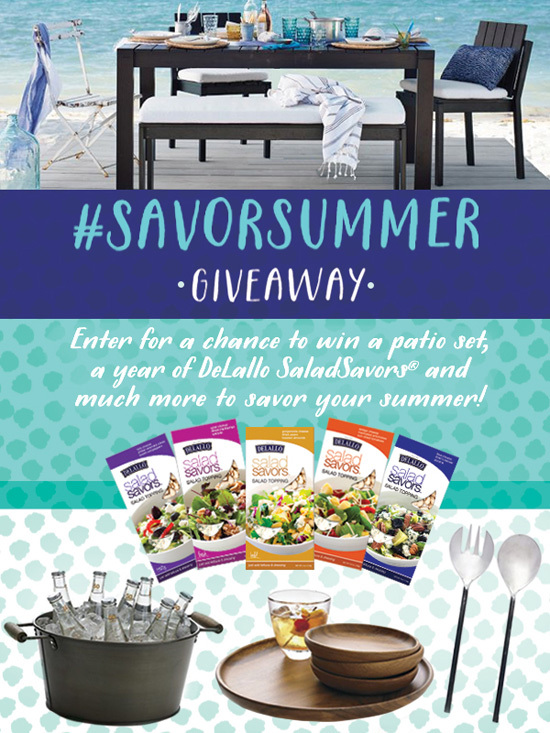 This giveaway is sponsored by DeLallo Foods and not affiliated with West Elm or Crate & Barrel. All opinions written are purely our own.